When I first started writing for EI, I intended to write a Video Risk for the movie "Brother John." The problem with reviewing "Brother John" is the fact that in order to hook the reader, you almost have to write a spoiler review. I hate doing that, but there seems to be no way around it. The good thing about the movie "Brother John" is that it is a mystical journey even if you have some idea what is coming. The film is also open to many interpretations. John Kane (Sidney Poitier)was born and raised in Calawah County, Alabama. He left home at age 16 to carry out his work. Doc Thomas (Will Geer) seems to be the only person in town who remembers John. Doc Thomas is intrigued by the fact that every time a relative of John dies, John returns to town. It is the year 1970 and John's sister Sarah only has a few days to live. Doc Thomas has a feeling that John will show up. He does. Calawah County is about to explode with violence. The civil rights movement has made inroads that can't be ignored. The county's biggest employer is facing a strike. Black and White issues have no simple answers. 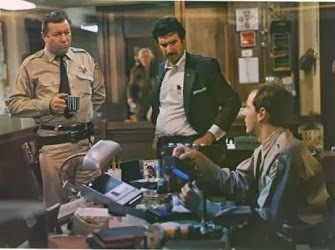 Doc Thomas's son Lloyd (Bradford Dillman) is the county's politically ambitious prosecutor. When word comes that an outside agitator is on the way to stir up Union trouble, Lloyd becomes suspicious of John. John also draws the eye of divorced schoolteacher Louisa MacGill (Beverly Todd). 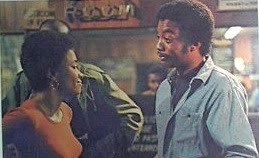 Louisa sees John as something more than the local guys like Henry Birkart (Paul Winfield) who aren't educated or refined. Like Doc Thomas, Louisa is soon to discover that John is more than he seems. 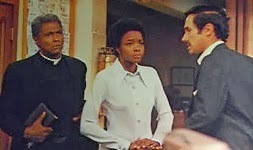 Leonard Maltin said of "Brother John," 'What would happen if Jesus returned and no one knew he was back, or that he was Black?' I don't necessarily agree that John represents Jesus in this fable of man's inhumanity to man, but John is certainly otherworldly. Be he Jesus, or an angel or someone akin to Michael Rennie's character Klaatu in "The Day the Earth Stood Still," Poitier's Brother John is certainly pissed off by the way man has turned out. The ominous thing about this movie is the fact that John's work is finished. Whoever sent him, is going to act real soon on John's observations. 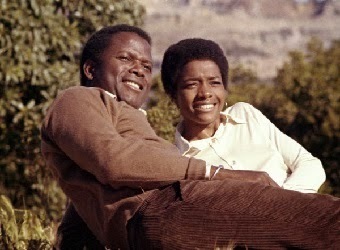 Sidney Poitier turns in a finely subdued performance as John. He carries his great burden like an unwanted tumor. The cat and mouse scenes between Will Geer and Poitier are the heart of the film. Their final scene in a county jail cell is chilling and enigmatic. There are fine performances by all involved. Some scenes are painful to watch, especially when Sarah's widower is humiliated in front of his children by a redneck deputy. "Brother John" is an indictment against the racial bigotry and violence that did, and still does exist in this world. Its message is clear. A rarely seen gem of the 1970s. Great movie, good sound and picture. No real extras. The film was nicely restored by Columbia. The picture is soft around the edges during some of the brighter daylight scenes. Nice delineation of darks and shadows during the nighttime scenes. The film has a gauzey look at times, but that was the intention of the filmmakers. This picture is much better than the copy I made off of TV about 20 years ago. 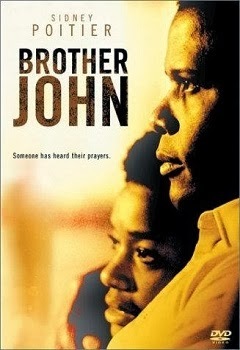 "Brother John" has a great melodic and bluesy score by Quincy Jones. The music sounds great, as does the dialogue and sound effects. Nice balance between the ranges. No distortion. Plain design. Easy to navigate. Nothing special. No Easter Eggs. No real extras. There are trailers for three Sidney Poitier movies being released by Columbia/Tristar. One of my favorite films. "Brother John" is as powerful today as it was when first released. This is one of the great undiscovered films of the 70s.